"Seinfeld" is coming to Hulu on Wednesday as the streaming video site cashes in one of its biggest programming bets to date. Hulu executives are hopeful that the library of episodes, 180 in all, will spur more people to subscribe to its $8-a-month service. 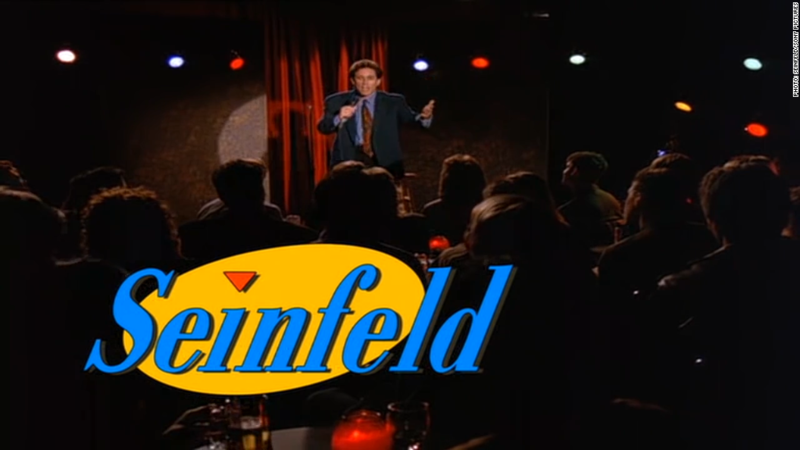 While some TV shows are available on Hulu for free, "Seinfeld" requires a subscription. "We think it's a one-of-a-kind property," Hulu CEO Mike Hopkins told CNNMoney. "There aren't too many shows that have a puffy shirt in the Smithsonian, for example." "We believe that we're going to be able to introduce 'Seinfeld' to a whole new young audience that's here at Hulu," Hopkins added. "We also think that Seinfeld will help us attract a new audience to Hulu." Hulu's subscription site, previously known as Hulu Plus, has signed up about 9 million households over the past several years. While significant, the number pales in comparison to Netflix's 40-plus million households in the United States. Hopkins said Hulu's goal is to get there. "We'd love to have that number and that's what we're shooting for," he said, crediting Netflix (NFLX) with "paving the way" in the streaming video marketplace. Much of Netflix's growth is now coming from international markets, while Hulu is only available in the U.S. Asked if the service will expand overseas, Hopkins said, "We'll have to see what the future holds for us internationally." Hulu is unusual in that it's co-owned by three of the country's biggest media companies -- Comcast (CCV), 21st Century Fox, and The Walt Disney Company (DIS). Hulu provides a way for people to catch up on TV shows they missed on channels like NBC and Fox, so it's an on-demand delivery system. It also presents brand-new series, so it's a channel in its own right. And it's about to start acting as an online store too, through a deal announced on Tuesday that will allow Hulu subscribers to add Showtime programming for $9 a month. Hopkins put it this way: "We're both outside and inside," poised to benefit no matter how the television landscape bends and twists. Hopkins said the subscription version of Hulu is the company's clear priority even though the free, ad-supported part of the site continues to thrive. Hulu's owners can potentially make a lot more money through the monthly subscriptions. They are spending a lot to get there -- projections call for several billion dollars in content acquisition costs in the years ahead. The bidding war for the series was "aggressive," Hopkins said, "and we're happy we won." Wednesday's launch marks the digital arrival of "Seinfeld," often called "a show about nothing" that nonetheless is one of the best-known sitcoms of all time. Reruns of the show are a fixture on local TV stations, through syndication deals, but only a smattering of episodes have been available online until now. Hulu is trying to make the most of the launch, posting dozens of clips from the series (eventually there will be thousands of clips) and buying online ads to promote its availability. It also opened a pop-up exhibit recreating the famous "Seinfeld" apartment in the Meatpacking District of New York this week.